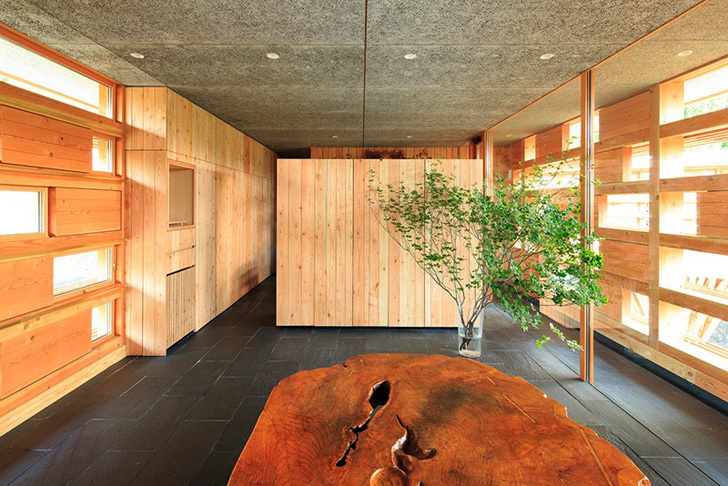 Japanese architecture firm Life Style Koubou recently completed their House in Itsuura: a single-story timber home located amid a lush forest in Japan's Ibaraki prefecture. With its minimal design and natural materials, the structure is embedded into the sloping terrain like a meandering timber treehouse. The elongated house is perched on two organically formed supports. The architects expect that, with time, the timber structure will eventually weather into the same color as the forest it hides within. Life Style Koubou’s intention was to create a very meditative atmosphere and the recreates an ambling walk through the home to reveal this atmosphere. The facade is punctured with small apertures, both scattered and small, that flit around the home’s timber frame and provide scattered yet satisfying lighting throughout the space. The windows flit around the home's timber frame and provide scattered yet satisfying lighting throughout the space. The elongated house is perched on two organically formed supports. The architects expect that, with time, the timber structure will eventually weather into the same color as the forest it hides within. Life Style Koubou's intention was to create a very meditative atmosphere. The video is intended to recreate an ambling walk through the home. The facade is punctured with small apertures, both scattered and small.